The city-state of Blacklight is located in the northwestern point of Morrowind, being deep in the territory of House Redoran, which typically takes up the northwest of Morrowind, around the border-town of Silgrad Tower, the city of Ald'ruhn, and the frontier of Raven Rock. Blacklight is a major port-city in Morrowind, being situated on the western end of the Inner Sea, across from the town of Gnisis. Not to mention, Blacklight is located rather close to the Dunmeth Pass, an important trading route that goes through the Velothi Mountains, to the ancient city of the Nords, the city-state of Windhelm. The land surrounding Blacklight is ruthless, known for having raiders, and highwaymen that operate across that portion of the Velothi Mountains. Blacklight's layout is unknown, however, the city's seat of power is known as the Rootspire, and it is currently where the Grand Council meet for business. With Blacklight's status as the capital, House Redoran had largely improved Blacklight to rival the grandeur of Mournhold. There is a Temple dedicated to Azura in Blacklight. Blacklight is a neighbored by several settlements, one of them being Cormar View in the west. In the mid-Second Era, the island district of Vvardenfell was lightly-populated, most from the Ashlander tribes, and rich with resources. The Dark Elves of Blacklight, along with the ones of House Telvanni had utilized the coast for the purpose of exploiting the resources and land that is closely available to them. These operations on the west coast were under the administration of the Great House nobility in Blacklight. In the aftermath of the Second Akaviri Invasion, an alliance consisting the Nords, Dunmer, and Argonians was formed, being called the Ebonheart Pact. House Redoran, and by extension, Blacklight was inducted into the Ebonheart Pact. In the late Second Era, Tiber Septim attempted to conquer the entirety of Tamriel in what would become known as the Tiber Wars, Blacklight, along with the city of Kragenmoor were at the forefront against the invasion coming from the west. But as time went on, the battle was in favor of the Third Empire, and so House Redoran of Blacklight was brought into the Third Empire. During the Imperial Simulacrum in the late Third Era, the city-state of Blacklight was ruled by Queen Vermith, when it had a rivalry with Ebonheart. When the city of Mournhold was sacked by the Argonians of the Accession War, Blacklight was named the capital of Morrowind. Blacklight had made a significant impact on the very early years of Morrowind in the Fourth Era. The Temple of Azura in Blacklight was taking care of the only survivor of the destruction at Gnisis, Neria Relethyl, caring her for many years, long after the Red Year. Her experience would later be documented. With Blacklight's ascension as the capital, the Great House Redoran had become the leading group of the Grand Council. It was there decision that led to degraded status of House Hlaalu, and the upgraded status of House Sadras. 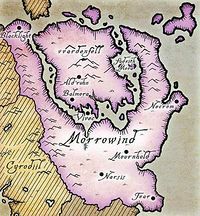 Blacklight has currently been the capital of Morrowind, as of 4E 201. In a similar situation as the town of Balmora, the city of Blacklight has both a localized Tamrielic name, which is "Blacklight," while the Dark Elves have their own equivalent which is translated into the Dunmer Language.